Looking for Ideas for Conference? Check these ideas out! I love the true story, and the question is so important... what's great about the Aaronic Priesthood, EVERYTHING! Love this article. 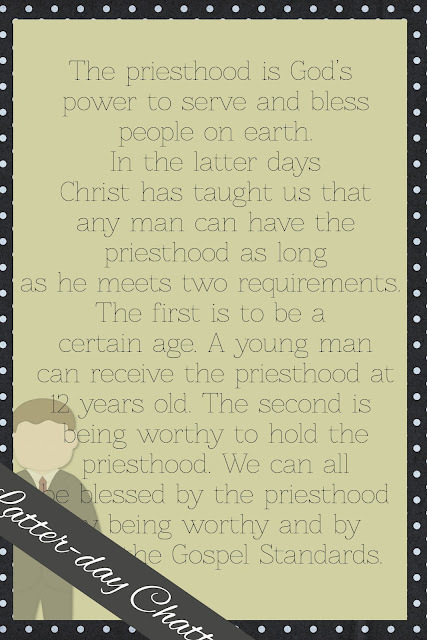 "What’s so great about holding the Aaronic Priesthood? Through its keys and powers, it helps us to live better lives, to be clean in our thoughts and actions, to show more love and respect to our parents and familymembers, to keep our bodies free from drugs, alcohol, tobacco, and other harmful substances. This power strengthens a young man and helps him to keep his mind and body clean and to have the courage to say no." The Aaronic Prieshood- a Gift from God - I love President Hinckley, he speaks to the young men, giving strong testimony of the Aaronic Priesthood. Very good talk for those almost getting the Priesthood, or being reminded of how important this is for our Church. "...for in the exercise of our priesthood, we are acting in behalf of God our Eternal Father and Jesus Christ, His Son."